Wow, it seems like ages since I've posted. I've been a very busy girl though! Celtic Wings is finished. 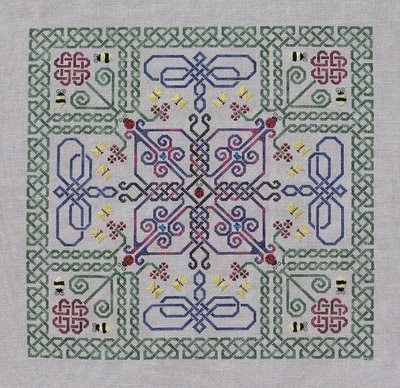 It will be officially released via European Crosstitch this week! The model was stitched on Sassy's Frosted Cafe in 40 ct (although you could stitch this on ANY count of linen!! I just like the tiny x's) using Hand-Dyed Fibers silks. The design size is 267x267. As always, though excited by the finish and release of a new design, I have a bit of an empty spot in my heart now that it's finished. It's almost like one of my children has grown up and is ready to leave the nest. Strange, but true. It will be a little while before I start a new model though, I have two pieces that I have to get done before I dive into another one! Both are a little time sensitive, so I want to focus on finishing them as quickly as possible so I can get back to some more model stitching. I have a wealth of ideas that are literally busting to get out. Congratulations on the new design! I love it! This is definitely going on my wish list. :) How do you decide what colors to use? Abi, I have to admit to being a little OCD when it comes to picking colours!! I usually pick the colours I want to stand out first - in this case the dragonflies and big butterflies at the centre. I know what I want it to look like basically, I just need to find the colours that match up to the idea in my head the best. I'll narrow it down to a couple of different colours for each that I really like. After that it becomes a bit easier, because everything has to go with the main colours. The green I wanted a bit lighter to brighten the whole piece up. The pink and the red were a bit of a challenge - the red had to be dark enough that it didn't clash with the pink. Once I've got a few different options picked out, I'll test stitch each combination together on my chosen fabric, and usually one combination will jump out at me as the one that works best. Surprisingly, this one that I finally went with was a far cry from my first thoughts. I had much brighter colours in my head, but after seeing them stitched, they didn't grab me as much as these ones did.